“Murder in the First" takes place in two worlds. One is cold, gray and artificially lit. The other is as warm as a cedar's dream, all sunlight and furniture polish, brass and tweed. The film is about how a man who lives in one of these worlds might learn to trust a man who lives in the other one. It is a good idea, but the film depends on us believing in the two men, and that isn't easy. The story unfolds during the same season that Joe DiMaggio was setting his record for hits in consecutive games; that's a favorite year for filmmakers, because it allows them to counterpoint DiMaggio's streak with their own characters' more obscure lives (see, for example, "Farewell, My Lovely"). 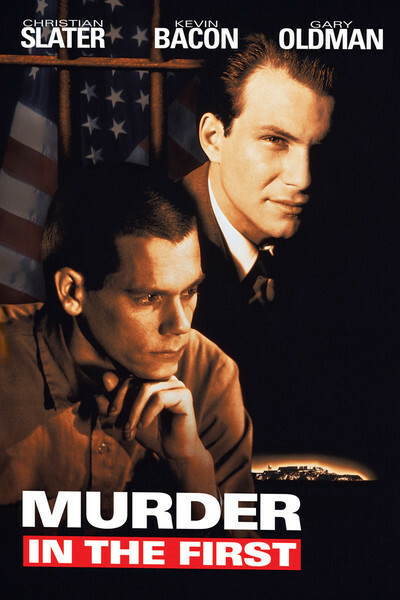 The plot involves a man named Henri Young (Kevin Bacon) who has been cruelly treated by the California prison system, and a lawyer named James Stampill (Christian Slater) who is appointed to defend him. Young, originally arrested for stealing $5 to feed his starving little sister, was later kept in solitary confinement for three years, went berserk, killed a guard, and is now being tried for murder. Stampill says the system, not the prisoner, is guilty. As the movie opens, Young has been driven into a tiny corner of his mind by the brutal experience of solitary confinement, and peers out suspiciously at the world. It is Stampill's task to win his trust. Stampill is a man who is always running. The first time we see him, he's chasing a San Francisco cable car. He's usually late. The movie has no particular purpose for establishing this trait; it's just background, designed to flesh out a character who needs it. There is no shortage, however, of background for Young, who is played by Bacon as such a mass of suffering and victimization that the actor needs every ounce of his considerable skill to keep from eating right through the scenery. The scenery is, to be sure, awesome. Alcatraz is seen on its bleak, cruel rock, and the world inside is carefully recreated. The movie's art department really grows enthusiastic, however, in the courtroom: Whether this is a set or an actual location I do not know, but if Architectural Digest ever does an issue on the legal system, this is the cover photo. The courtroom is so interesting, in fact, that it almost upstages several important moments; we're looking at the chairs and wondering if they're real, and how much they cost. This is one terrific courtroom. It is presided over by Judge Clawson (R. Lee Ermey, the former Marine drill instructor who starred in Kubrick's "Full Metal Jacket"), who runs a tight ship, barks commands, has a quirky personality, and is fun to watch, although only a judge in a movie would allow the ending of this trial to unfold as it does. Other important characters include Gary Oldman as a sadistic Alcatraz warden who administers the inhuman punishment system, and Stefan Gierasch as the California state prison chief, who doesn't have a clue what's going on. William H. Macy has the thankless role of the prosecuting attorney. But most of the film is given over to the relationship between the accused and his lawyer, and Bacon and Slater spend a lot of time in two-shots together, holding intensity contests. Slater, who in certain shots looks curiously like Kevin Costner, is an actor with talent, but he is too young for this role, and not confident enough to dial down a little. Like DiMaggio the same summer, he wants a hit every time he goes to the plate. Hollywood sometimes goes on youth kicks like this, casting kids in their mid-20s in roles where a substantial character actor is called for. Eventually we stop believing in the story, and then we stop caring, and then we start admiring that great furniture.